Originally services were conducted under an archway of trees where Mrs HUSSON's house now stands, by the first vicar, the Rev F.T.C. RUSSELL, who was appointed to this large parish in 1850. Services were later held in the old Vicarage, now occupied by Mrs BLACKBURN; afterwards in the school building known as the Common School, till the present church was built in 1866. The late Dr. RUSSELL labored in this parish for 24 years. He was returning from a long trip in the parish when he was seized with a paralytic stroke. He was alone and driving a pair of quiet ponies, and was still some miles from the parsonage, with at least one pair of gates to open. Fortunately he succeeded in accomplishing the task and reached home safely. For some weeks the patient was kept very quiet; then a sea trip was recommended by his medical adviser, which was made possible by his many friends and admirers, who subscribed the sum of £1000, a further sum of £500 being sent to him while abroard. When returning to Victoria he died and was buried at sea. The Rev Jas. McFARLANE was appointed in his place, and remained Vicar to this parish for 21 years. 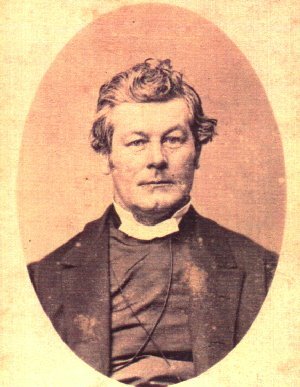 During his tenure, St Peter's, Merino, was cleared of debt, and consecrated by Bishop THORNTON of Ballarat, on October 29th, 1884. The Church Committe elected in 1877 was Messrs T.D. CLARKE, W. ENSCOE, W. FRANCIS, J. FULTON, F. HENTY, C. LEITHRIDGE, T. MACKWOOD, Jas MALLETT, Geo NORTHCOTT, and T.W. SILVESTER. Other churches built in the parish were St John's Digby, 1861; St Paul's, Gum Creek, 1877, later moved to Henty in 1901. Henty having acquired a new brick church through the generosity of the late Miss HENTY, the Gum Creek church was gain moved, to Paschendale soldier settlement in 1937 and re-dedicated by Bishop JOHNSON, February 17, 1937. The new Henty Church was erected in 1936 by Mr Chas ANDERSON at a cost of £800, being a legacy from the late Miss Henty, daughter of of the late Francis HENTY, pioneer of this district. The foundation stone was laid by his grand-daughter, Mrs G.A. SILVESTER, on 11th October, 1936. The newly erected church was consecrated by the Right Rev W.H. JOHNSON, Bishop of Ballarat on Monday, December 14th, 1936, the Vicar of the Parish then being Rev K.P. GOODISSON. A.M.D.C. and loving memory, Francis Henty, 1815-1891, who landed at Portland, 13th December, 1834, and settled at Merino Downs, 3rd August, 1837, and his wife, Mary Ann Lawrence, 1819-1881, with their children - Lawrence Shum, 1845-1877; Louisa, 1847-1924, Fieldplace, Kew; Caroline, Mrs A. McLeod, 1849-1914, Talisker; Alice, 1852-1932; Mrs John Hindson, of Canterbury and Sorrento. Lead-light windows erected by the children of the above Caroline and Alice, in honored memory of these heroic pioneers. Names of Clergy:-Rev. Dr. F.T.C. RUSSELL, 1850 to 1874; Rev J. McFARLANE, 1874 to 1893; Rev E.H. DAVIS, 1894 to 1898; Rev R.J.E. HAYMAN, 1887; Rev King William POBJOY, 1894; Rev J.W.DAVISON, 1898 to 1906; Rev M.C. JAMES (now bishop of St Arnaud), 1906 to 1915; Rev Edward SCHWEIGER (now Dean of Bendigo), 1911 to 1915; Rev F, CAFFIN, releiving above during 1914 and 1915; Rev. F.T.C. Reynolds, 1915 to 1919; Rev J.A. McQUEEN (now Canon), 1919 to 1921; Rev A.S. NICHOLAS, 1921 to 1924; Canon Howard CARR, 1924 to 1925; Rev Frank GIRDLER, 1925 to 1928; Rev Auguste WILSON, 1928 to 1929; Rev A.G.T. KEWLEY, 1929 to 1933; Rev F. S. LEGG, 1933 to 1934; Rev K.P. GOODISSON, 1935 to 1937; Rev John HALL, Th.L., F.R.G.S., present Vicar. The church bell was presented to the church by Mr and Mrs A. M. McLEOD in 1906. The Parish Hall was erected in 1907. 1865 : Laying the Foundation Stone, St Peter's Church of England, Merino. "The Hamilton Spectator" (Vic.) Saturday, 22nd April 1865. The story has been often told how, more than a quarter of a century since, Major Mitchell, after his discovering the Wannon, penetrated to Portland Bay, and there found the Messrs. Henty, and how, on hearing of the richly grassed country and well-watered plains which lay but fifty miles northward of the settlement they had formed, they pushed their flocks and herds onwards, and so became the pioneers of the Western pastoral district. The site of their first homestead is nigh the township of Merino, and for many years, without aid or protection from Government, at a great outlay of money and risk of life, they held without dispute the tenure of the country opened by their enterprise. Messrs. Winter, and after an interval the Coldhams, Whyther, and Pillean [sic Pilleau], entered the field. All these settlers took up the beautiful and fertile valleys of the Wannon and Glenelg. Having borne the costs and toil, the pastoral rights were conceded by the Crown to these early settlers. When the way was made clear and all difficulties removed, and the venture proved commercially good, others rapidly poured into the district : the privileges of the elder settlers were restricted to a space sufficient for the stock they actually held, with an allowance for natural increase. But it is only with the growth of our democratic institutions that it has been held just to drive off the first settlers to make room and "give a chance" (so the phrase is) to the many, helped for the most part to the better food and higher wage of Victoria, by funds created by the daring, and fare and capital of the early squatters. We have no desire to stir the troubled waters of Victorian politics, but our review of the past leads us to say that a hard measure of justice has been dealt out to the Wannon pioneers. The name of Merino, as of Muntham and Sandford, tell of the Sussex hamlets whence these early colonists came. On Easter Monday, the gathering of people, and crowds of excited children, showed that something of no ordinary interest was afoot in Merino. The British Ensign, "The flag that has braved a thousand years,'' floating on the breeze, pointed out the scene of attraction. The corner-stone of a new Church was to be laid, and the annual feast of the school kept. At two o'clock, the Rev. Dr. Russell, in all due form, after reading select parts of Scripture and the chanting of psalms, declared the corner-stone and foundation of a Church for the use of the parishioners of Merino, to be called the Church of St. Peter, to be well and truly laid, in the name of Father, Son, and Holy Ghost. Appropriate prayers were said, and then Dr. Russell delivered an address of some length. He traced the successive stages of progress made in establishing the ordinances of religion at Merino, until it was resolved provide a Church, which would afford room for the seemly and reverent celebration of the Divine offices, and stand forth as a memorial of the homage due to God from His creatures. The plans, prepared with much skill and taste by the architect, Mr. Fox, shewed a nave 60 feet by 25 feet, with a southern porch, transepts, chancel, and a central tower. The nave complete in itself would suffice for the present, and the further needs of the parish could be met by extensions, without violence to the original design. The characteristic features of a true ecclesiastical edifice were faithfully observed, so that the traveller as he approached Merino and caught sight of St. Peter's, would at first glance recognise it as a Church, and not a little Bethel or a Salem Chapel. The details might be meagre, and the style severe, but all was real, and honest and true, being what it pretended to be. Dr. Russell spoke very earnestly as to the propriety of a Church having ample space for the decorous worship of God ; he thought that people should not be cooped up in narrow pews so that reverence of body became impossible, but in body as in soul they should bend meekly before the Throne of Grace. A church should be open to all alike--rich and poor, high and low. It should not be an assembly-room for a select company--a middle-class luxury--a deposit of some one or other strata of our social system. But, besides this, there was another purpose a Church should serve ; it ought to be an outward, visible token of man's gratitude to God. This holy season admonished them of their deep debt to Him who suffered poverty, humilation, betrayal, agony, death, that they might have pardon, peace, and bleasedness. What a proof of deadness of soul they gave if their hearts did not burn to testify before men and angels their adoration of Him who so loved and gave Himself for them. No doubt love to Christ was best manifested by doing His will, loving one another and comforting the destitute and afflicted ; but while these things should be done, why leave the other undone ? We are not left to our own promises here. Once upon a time a pour soul whose heaviness gave place to rest and joy in Christ, came where the Lord "sat at meat," bringing au alabaster-box of ointment, very precious, and she brake the box and poured out the odorous ointment on the Saviour. One of the company rebuked the waste. The cost (so high) had better been given in alms to the poor. Jesus' tender comment was "Let her alone." "She hath wrought a good work. This she hath done shall be told as a memorial of her wheresoever the gospel is preached." It was Judas Iscariot who found fault, and we are distinctly told that he was a thief, and his care of the poor was a pretence. May there not be in our own times the acting over again of this very scene? A full heart, glad to spend and be spent for the Lord Jesus. A bitter critic standing by casting blame upon the zeal shown for the house of the Lord and the offices thereof, suggesting something more Evangelical, plain cheaper ! Raising up objections as a pretext to cover a churlish disinclination to give. A thief because he robs God of what He claims as his due. The benediction was then pronounced. An elegant and most plentiful repast was prepared by the ladies of the neighbourhood for the children. When all had partaken and enjoyed merry games, and prizes were distributed, the proceedings of the day closed.